The Cover Up series takes as its starting point a particular object (in this case a de Kooning painting from the Woman series). This is then covered with a light fabric as it might be if placed in storage for protection or left in an abandoned room. The shrouded object is then scanned and remade as a hard, pockmarked resin sculpture using CNC technology. The result is an abstracted version of the original—no longer a camouflaged painting but a three-dimensional colour field that dips and rises where folds of fabric once were. Callum Morton is an artist based in Melbourne, Australia. In addition to his studio work, he is Professor and Head of Fine Arts at Monash University. Callum’s career has combined academic positions and engagement with studio practice. He has held academic positions at the Art Centre College of Design in California, the University of Melbourne and RMIT. His artwork has been displayed in numerous galleries worldwide, including the Santa Monica Museum of Art, the Hamburger Bahnhof and the Ian Potter Centre. 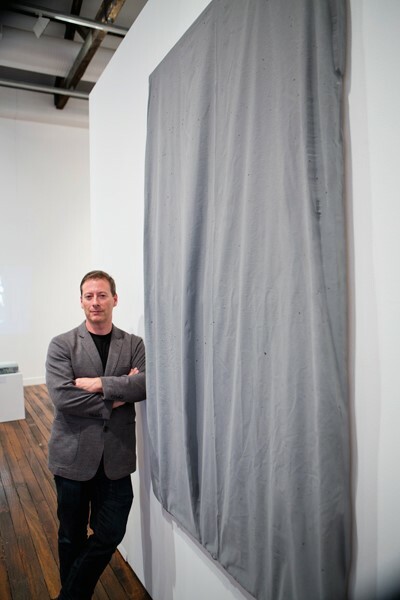 He represented Australia at the Venice Biennale in 2007.